Baton Rouge, LA – July 2, 2018 – Lamar Advertising Company (Nasdaq: LAMR), one of the largest out of home media companies in the world, is teaming up with Wieden+Kennedy, OMA, PHD, Clear Channel Outdoor and Wow Media as part of a dynamic digital billboard campaign using real-time flight data to encourage weary international travelers arriving at Los Angeles International Airport (LAX) to “sweat away” their jet lag. 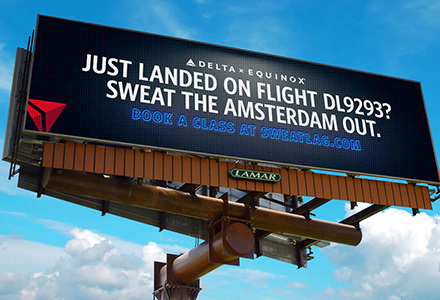 Beginning June 28th, digital billboards in proximity to LAX are displaying messages intended specifically for passengers arriving on the most recently landed Delta red-eye flight from one of five international and three domestic cities. Using data from FlightAware, the billboard content will feature the flight number and city of origination, encouraging passengers to hit the gym and sweat their jet lag away. Billboard content will dynamically change shortly after the selected flights land, as dictated by the data, to reach passengers as they leave the airport. It is the first time real-time flight data is being used to dynamically trigger the creative content on a digital billboard. Real-time flight data from FlightAware will populate the flight number and city of origin on digital billboard creative from eight international and domestic flights, reaching passengers as they leave the airport. The four-week campaign, utilizing a total of 10 digital billboards, will conclude on July 22. 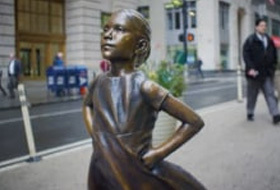 Founded in 1902, Lamar Advertising Company (Nasdaq: LAMR) is one of the largest outdoor advertising companies in the world, with more than 348,000 displays across the United States and Canada. Lamar offers advertisers a variety of billboard, interstate logo, transit and airport advertising formats, helping both local businesses and national brands reach broad audiences every day. In addition to its more traditional out of home inventory, Lamar is proud to offer its customers the largest network of digital billboards in the United States with over 2,900 displays. Please feel free to explore our website www.lamar.com or contact us at hello@lamar.com for additional information. Out of Home (OOH) advertising is enjoying a resurgence. The adoption of new measuring techniques and location intelligence is empowering OOH to keep pace with advertising on digital channels like Facebook and Snapchat. Now, OOH advertisers can better understand who is viewing their ads, which helps them target content more precisely than ever before and better measure the ads’ impact. At last year’s Cannes Lions International Festival of Creativity, the most awarded campaign was an out of home activation. Industry experts share their thoughts on what makes an award-winning campaign and why outdoor ads are an effective medium for creativity.